What is the Aircast Hand & wrist Cryo Cuff with Cooler? The ultimate hand & wrist ice therapy/cryotherapy device. Provides compression to minimise bleeding and swelling, and cold to minimise pain following hand & wrist injury. Many elite athletes use this product following hand or wrist injuries and hand surgery. Anyone with a hand or wrist injury can also benefit from using this product. It can be used at home for the treatment of all hand & wrist injuries, such as sprained wrist, dislocated wrist, hand & wrist arthritis, broken hand, broken wrist, carpal tunnel syndrome, following wrist arthroscopy and hand & wrist surgery. The Hand & wrist Cryo Cuff with Cooler is one-size for adults. The Aircast Hand & wrist Cryo Cuff with Cooler is an easy to use device that circulates ice cold water to provide cold therapy in the treatment of injuries. This version is specific for the hand & wrist and offers the very best option in ice and compression therapy. The Aircast Hand & wrist Cryo Cuff with Cooler combines the therapeutic benefits of controlled compression to minimise bleeding and swelling in the hand & wrist, and cold to minimise pain. The cuff is anatomically designed to completely fit the hand & wrist providing maximum benefit. The cooler element is universal to all Cryo Cuff models. 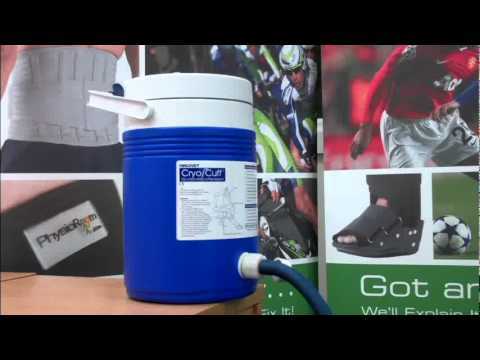 The Cryo Cuff Cooler holds water and ice needed for 6-8 hours of cryotherapy - much longer than an ice pack. The durable cooler comes with a tube assembly and insulation disk and is labelled with simple-to-follow directions for use. The information provided comes direct from the manufacturer and is not in anyway endorsed or substantiated by PhysioRoom.com. Aircast Hand & Wrist Cryo Cuff & Cooler - Reusable Injury Cuff - Reduce Wrist Pain, Swelling & Inflammation is in stock and available for immediate dispatch from our Warehouse facility in Lancashire, UK. Orders placed by 4pm Monday to Friday (excluding Bank Holidays) are dispatched the same day. If you need your Aircast Hand & Wrist Cryo Cuff & Cooler - Reusable Injury Cuff - Reduce Wrist Pain, Swelling & Inflammation in a hurry, next working day delivery is available for UK mainland addresses.